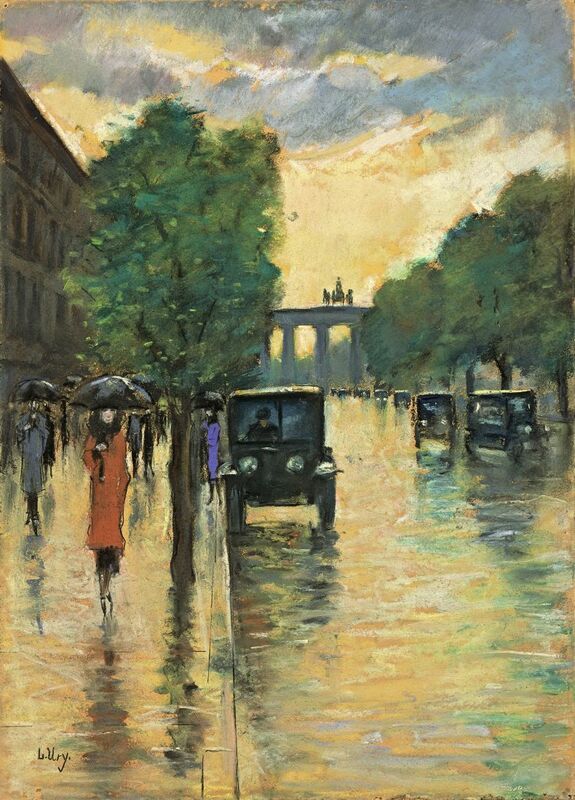 Lesser Ury (1861–1931), Unter den Linden with View of The Brandenburger Gate (c 1920s), pastel on paper, 49.5 x 35.3 cm, Private collection. Wikimedia Commons. The nineteenth century saw change on a scale that no one could have expected. The coming of the railways was a very important part of that, but there was plenty more. The streets and roads were steadily transformed from being dusty tracks which so easily turned into deep mud, to being paved or cobbled. The traffic on them changed too: pedestrians only had to dodge horses and carriages in the early decades, but by 1900 there were plenty of bicycles and the first cars. The growth in different forms of ‘horseless carriage’ was then very rapid, with most cities mixing cars, omnibuses, trucks, trams, and other forms of transport on the same crowded streets. Paul Hoeniger (1865–1924), Spittelmarkt (1912), media and dimensions not known, Stiftung Stadtmuseum Berlin, Berlin. Wikimedia Commons. Bicycles were generally of the ‘penny farthing’ type, with one very large wheel and a much smaller one behind, from around 1870 into the 1880s, when they were rapidly replaced by the ‘safety’ bicycle. The latter became very popular from about 1890 onwards, and were particularly transformative for many women, who were at last able to enjoy some freedom and independence. The Tour de France cycle race was inaugurated in 1903, and was soon one of the major sporting events in France. Édouard Manet (1832–1883), Le Vélocipédiste (The Cyclist) (1871), oil on canvas, 53 × 20 cm, Private collection. Wikimedia Commons. Wikimedia Commons. Manet’s remarkably early oil sketch Le Vélocipédiste (The Cyclist) from 1871 is probably the first depiction of a cycle by a major painter. Others followed, still on their ‘penny farthings’. Robert Alott (1859–1910), On the Beach at Ostende (1888), oil on panel, 26 x 53 cm, Private collection. Wikimedia Commons. 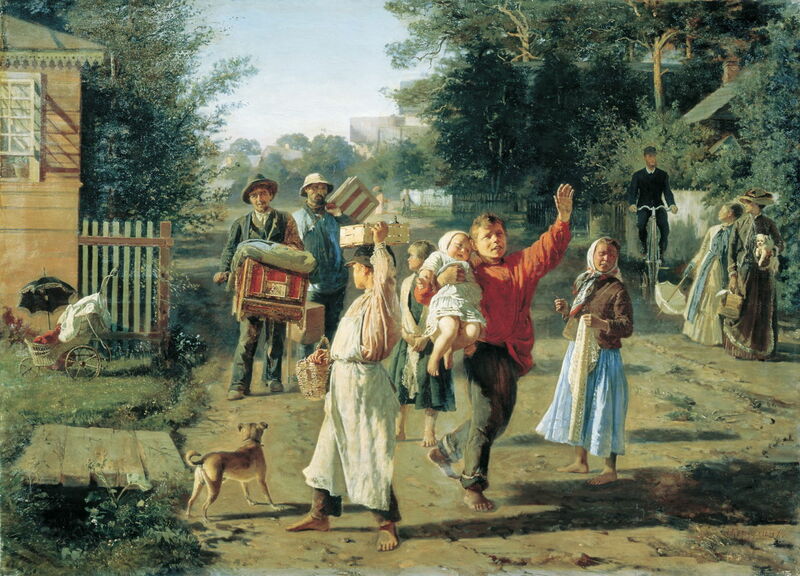 Alexey Korzukhin (1835-1894) Petrushka Goes! (1888), oil on canvas, dimensions not known, Radishchev Art Museum, Saratov, Russia. Wikimedia Commons. Cycling was also a valuable means for the lightly-equipped plein air painter to get out into the countryside. Although trains were now able to move people at relatively high speed to country towns, watercolour painters in particular were able to travel far from a railhead on a bike. This was not so practical, of course, for those painting in oils. By the early decades of the twentieth century, some artists were touring remote areas on their bikes, painting and sketching in locations which had previously been almost impossible to reach. Cars, and even bicycles to a degree, arrived too late to inspire the Impressionists, although given their normal attraction to the modern ways of life, it is a little surprising that the mainstream Impressionists do not appear to have painted cyclists or cycling, in the way that they did of recreational boating, for instance. Renoir, at least, was quite a keen cyclist, and blamed some of his later arthritis on a cycling accident in 1897. In about 1895, Degas took a photograph of a young woman on a cycle in the country, which is now in the Musée d’Orsay’s collection. Yet neither artist appears to have been moved sufficiently to paint anyone cycling, in the way that Manet did over twenty-five years earlier. 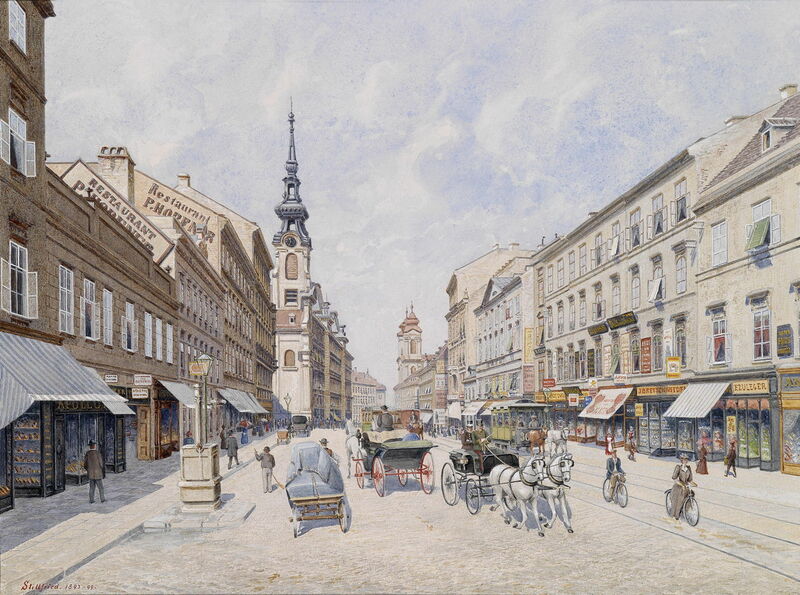 Raimund von Stillfried (1839–1911), The Inner Mariahilferstraße (1893-1899), watercolor on paper, 34 x 46 cm, location not known. Wikimedia Commons. The careful watercolour of Raimund von Stillfried, in his The Inner Mariahilferstraße (1893-99), captures cyclists sharing the road with trams, an extremely dangerous situation for the cyclists who could easily catch a wheel in the tracks. Jean Béraud (1849-1935), The Cycle Hut on the Bois de Boulogne (year not known), media and dimensions not known, Musée Carnavalet, Paris. Photo (C) RMN-Grand Palais / Agence Bulloz. When Cycle Madness broke out in Europe, races started to take place in city parks, and cafés were converted to cater for the wheeled customer. 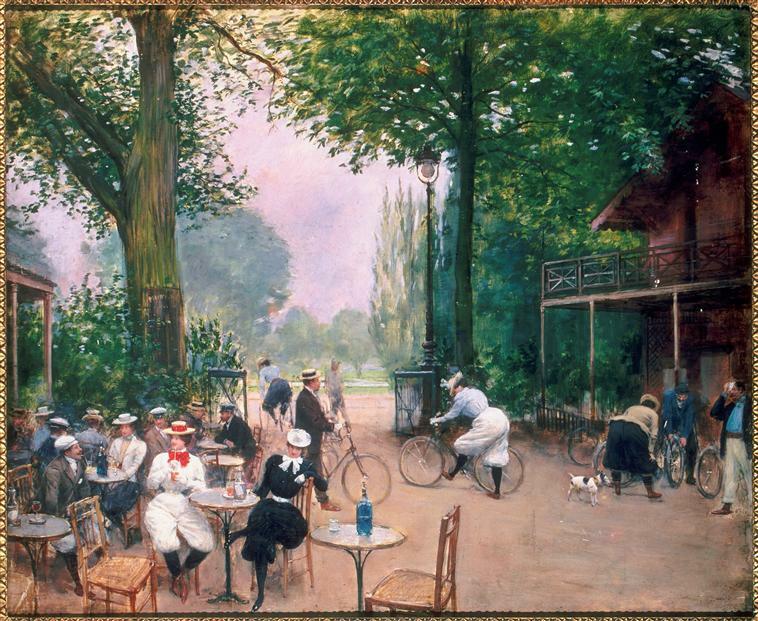 Jean Béraud shows this in his The Cycle Hut on the Bois de Boulogne, which was probably painted around the turn of the century. 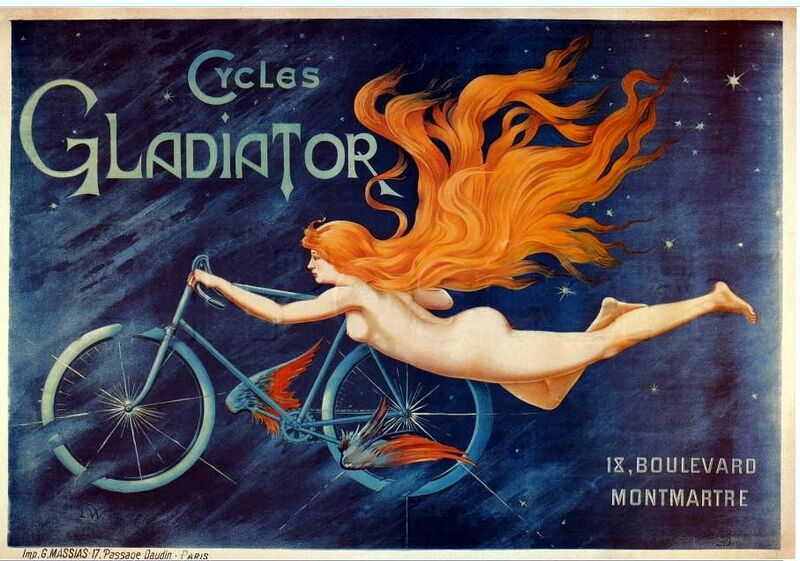 Unknown, Advertisement for Cycles Gladiator (Gladiator Cycle Company) (1905), lithograph by Georges Massias, Paris. Wikimedia Commons. Promotional material such as posters became increasingly fanciful too, perhaps referring to paintings of the Pre-Raphaelites and their successors. 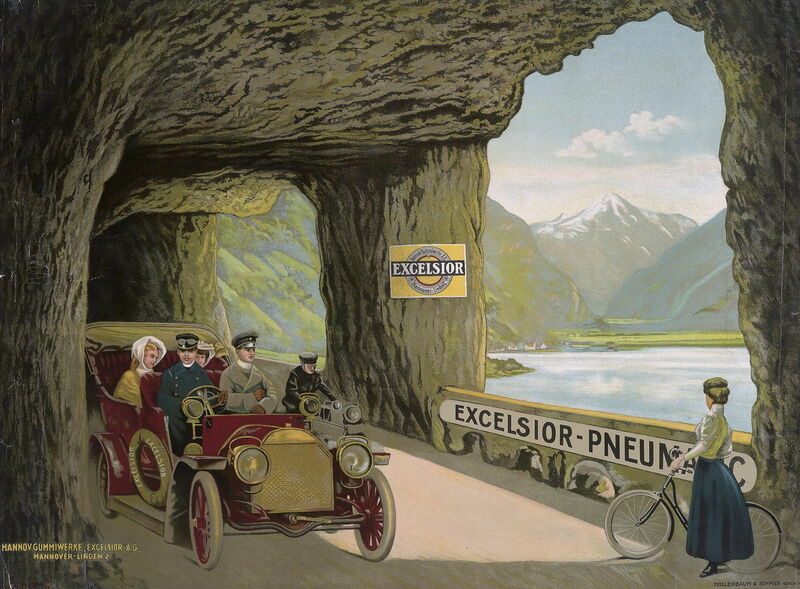 Unknown, Advertisement for EXCELSIOR PNEUMATIC (c 1910), printed by Hollerbaum & Schmidt, Berlin, 97 x 72 cm. Wikimedia Commons. 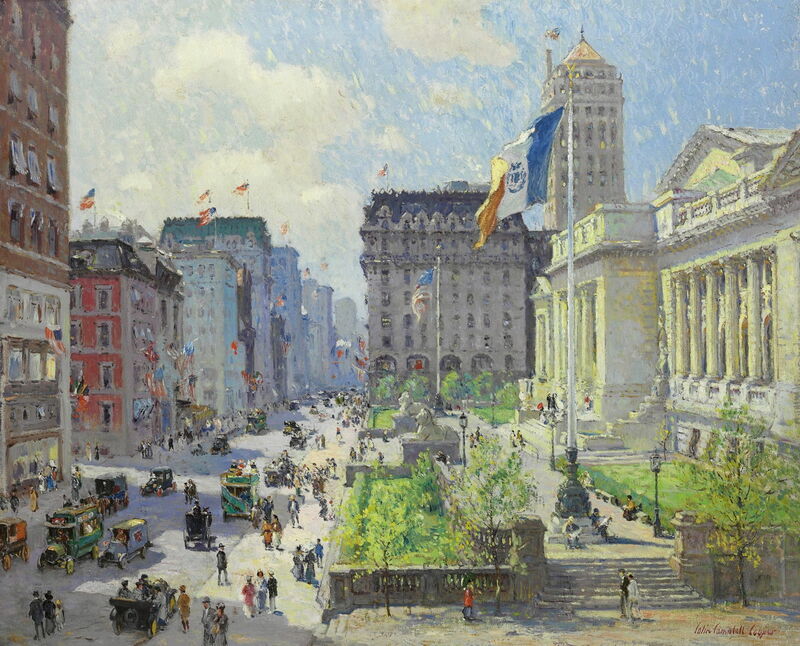 It was the generation of painters who followed the Impressionists who were the first to really show the changed streets, roads, and public spaces. 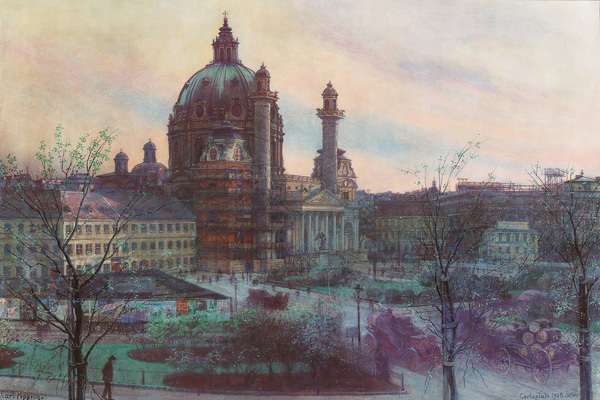 Carl Pippich (1862–1932) Carlsplatz, Wien (1908), pastel, 67.6 × 100.2 cm, Private collection. Wikimedia Commons. 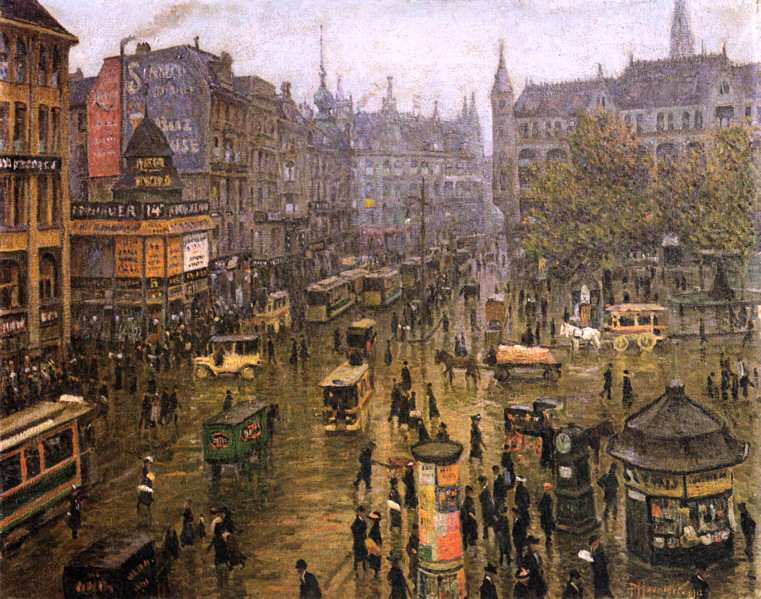 Carl Pippich uses contrasting colour to distinguish the cars in his pastel painting of Carlsplatz, Wien (1908). Lesser Ury painted many small plein air works in Paris and Germany during the 1920s, which reflect the dramatic changes that had taken place since the days of Monet and Pissarro. 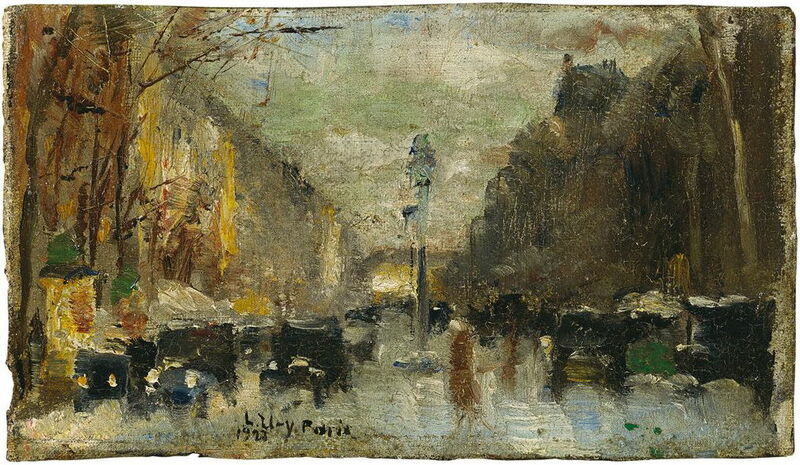 Lesser Ury (1861–1931), Boulevard in Paris (1928), oil on canvas, 9 x 15.8 cm, Private collection. Wikimedia Commons. 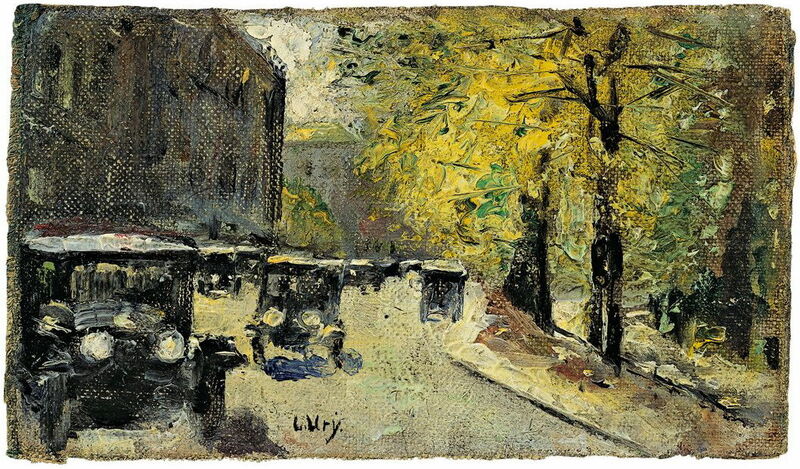 Lesser Ury (1861–1931), Street in Tiergarten (c 1920s), oil on canvas, 9.2 x 16 cm, Private collection. Wikimedia Commons. 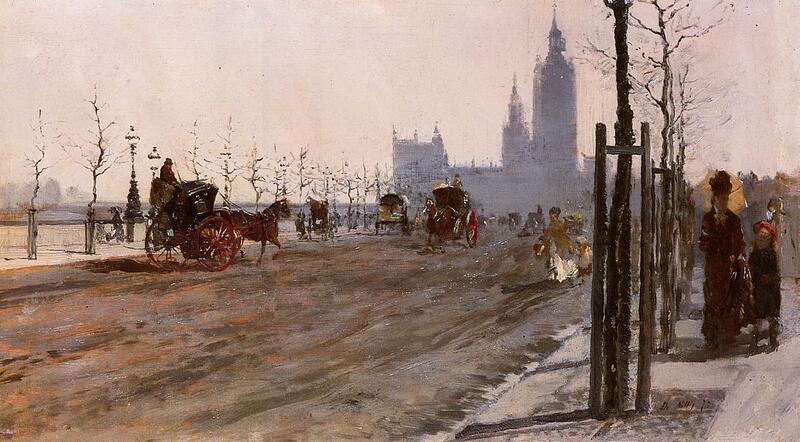 Konstantin Korovin (1861–1939), A Boulevard in Paris (before 1939), oil on hardboard, 44.5 x 64 cm, Private collection. Wikimedia Commons. 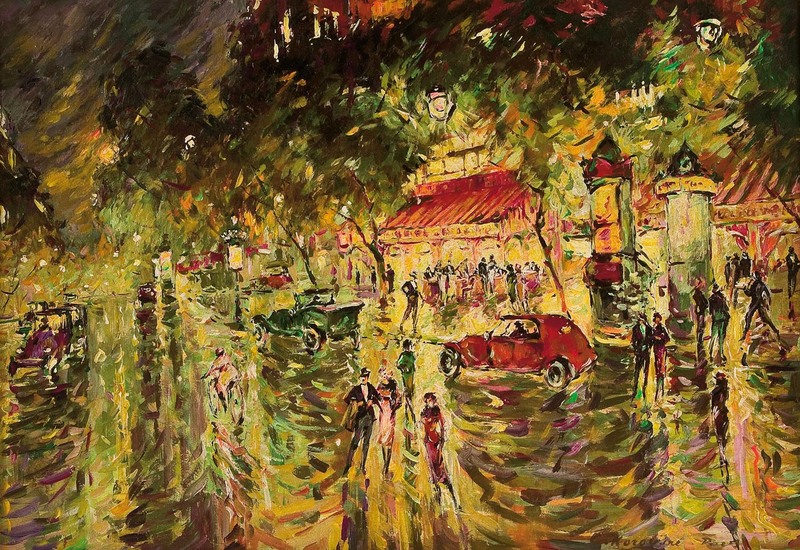 Later still, Konstantin Korovin made cars a part of the garish and dazzling nightlife of A Boulevard in Paris (before 1939). My final painting, though, is very recent, long after painting cars and bikes had become commonplace. 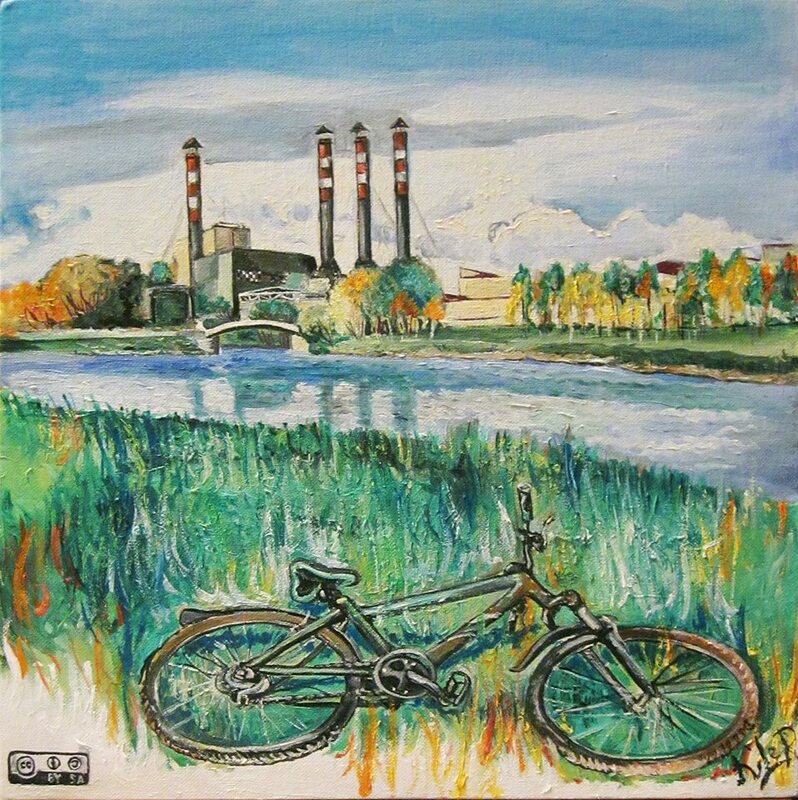 Sviatlana Jermakovič’s The road to Serabranka District (2013) not only stars the bike in the foreground, but claims to have been the first artwork marked with the distinctive CreativeCommons license: one of the twenty-first century’s innovations. Sviatlana Jermakovič, The road to Serabranka District (2013), oil on canvas, dimensions not known, location not known. Courtesy of the artist, via Wikimedia Commons. Posted in General, Life, Painting, Technology and tagged Alott, cars, Cooper, cycling, de Nittis, Jermakovič, Korovin, Korzukhin, Manet, painting, Pippich, roads, Ury, von Stillfried. Bookmark the permalink.